The state of Alaska is huge, one-fifth the size of the Continental US with many areas for climbing ice, most able to fill their own guidebook. This guidebook is for the Anchorage and Southcentral Alaska areas, and emphasizes the most popular areas and a few that are not so well known. Of course there are more areas but for now I elect to omit them for several reasons. This guidebook includes select climbs to add to your tick list but by no means does it cover all areas or climbs within an area. It mostly consists of the climbs I have done or at least the ones I would consider the most significant routes I have accomplished within the area. I tried to include climbs from all grades but that is not possible with all areas. Some areas, the easiest climb is grade 4 while other areas the stiffest climb is grade 4. I also tried to include all the climbs in the most popular areas like the Seward Highway, Portage, and Eklutna Canyon. What you won't find is, detailed route info to spoon feed the beta except on rare occasions that I feel it is warranted. Climbing is about adventure so get out your topographic maps, use a little of your brain and go climbing. If you need to know which climb is which by a photo, what rack of gear is preferred, require a route description topo map to go climbing then find a new passion. There is no record of the first ascents either. I could research this information but all that would do is take extra time and what does it really matter anyway but to inflate ego's. Also, some of the names of the climbs are left out, might not be correct or what you call them and I am sure there are those who will disagree with what I grade them but this my guidebook and if you don't like it, write your own. There are out-of-print guidebook's for Anchorage and Valdez that most climbing magazines still report as being available, they are not. Both these guidebooks are available for viewing only at Alaska Mountaineering & Hiking. For more information on these or other climbs in the area, please send an email or stop by Alaska Mountaineering & Hiking and talk to the climbers who work there. Routes in Southcentral Alaska use a revamped New England / Scottish style of grading ice. This system of grading takes the steepness, length and commitment of the climb and puts it into one grade. Grades do not take into account approaches or descents, only the climb itself is graded. Acquiring technical difficulties will be hard to judge in Alaska by the grade alone. More than one climber from outside (not from Alaska) has refereed to this odd grading system as "Alaskan Grade" which of course it is. A route that is very short for it's grade can be expected to be steeper with poorer ice conditions than a longer one of equal grade. Because of their short length, some climbs can be a Water Ice (WI) technical number grade harder than the listed grade; e.g., some grade 4's if given a technical WI grade can be as a high as WI 5+. Grades don't mean squat. There are too many variables for a consistent grade of individual climbs. The grades listed here reflect what should be considered, good condition but by all means it does not take all variables into account. A grade 4, 5 or 6 Alaskan ice climb can have sections of very thin ice with poor protection or even sections of pure rock, it's their length that keeps the grade low. Climbs done is the early season on thin mixed ice and/or deep winter cold will have more commitment added to the listed grade than thick soft plastic ice in March and April. Most climbs were established long before the current South 48 grading system: V, 5.7, WI5, M5 in which this climb could be grade 4 in Alaska. Grades really don't mean squat. For those who travel up from the US expect the ice to be harder and more brittle than what you find in the South 48. Be prepared to add a + rating or even a full grade up if climbing in the deep cold of December-February. Ice climbing at Caribou Creek or Nebesna in January during a clear sky high pressure system has to be experienced to understand. Come the end of February, the days grow long and the ice starts to soften and become plastic which is what most grading reflects here. Grade 1: A low angle climb that has no steep ice. Grade 2: A moderate angle climb that has steep ice sections of less than 25 feet. 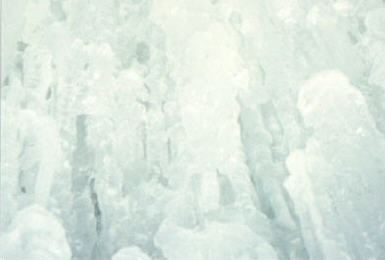 Grade 3: A moderate-high angle climb that has steep ice sections between 25 and 50 feet in length. Grade 4: A high angle climb with steep ice sections between 50 and 100 feet with few places to rest and good to OK protection. Can have sections of thin ice and can even have a fifth-class rock move. Grade 5: A high angle climb with steep sections between 100 and 200 feet with very few, if any places to rest, Ok to marginal protection can be found and retreat hard but possible. Grade 6: A steep climb from the ground up on bad ice, thin ice or no ice with marginal to no protection, no place to rest and retreat extremely difficult if possible. Many grade 6 climbs in Alaska are mixed affairs and there is no Alaska grade higher than 6. What you don't see here is the "M" grade rating system for mixed climbs so commonly used now. But, there is a push by new climbers, both new to Alaska or climbers who started climbing in the past decade to use the technical WI 1-7 grade for ice and M 1-10 grade for mixed that is commomly used outside of Alaska. These new grading systems are applied to more recent ascended climbs but is also being used to re-grade the older climbs too. I for one wish they would not and leave Alaska's grading system to the pioneered grading system but like Alaska in general, we are being consumed by the South 49 states way of doing things. While the older climbers of the area are not real fond of this idea and want to keep Alaska as its own beast, they are not hindering it either. Last time, grade's don't mean squat. This is one of the best things about ice climbing in Southcentral Alaska, short easy approaches, well almost. Most approaches are in well-booted trails up flat terrain of river canyons and can be less than a mile from the car to the first climb. Even after a heavy snowfall the packed trail is easy to find and firm enough to leave the skis at home. But at times, these moose trails up the river canyons get deadended by overflows or open water. Many areas will be a yoyo approach until finding the connected passage on frozen shelf ice. And on another note, pools of churning water must be navigated on narrow ledges of shelf ice, some less than a boot width wide with fifth-class rock holds for your hands. Add in the churning water flows back under thick shelf ice, sweating bullets is a common phrase. Thin ice is also a common approach hazard and every weekend there is a new member of the polar bear swim club. Head into less frequented areas or the true backcountry and hours on skis will be the ritual. But, if you are lucky enough to own, have access to or can bum a ride from a snowmachine, once again, a possible easy approach. And it is true; climbing along the Seward Highway is belay-from-your-car close: five-feet from passing cars at highway speeds. Rappelling is the most hazardous aspect of climbing and it is no different in Alaska. While most ice climbs have big trees at the top and along the sides, many require fashioned anchors to rappel. Most climbs can be walked off from but be prepared for a long, laborious hike through deep snow, avalanche terrain, deadfall trees and Devils Club. Even fewer climbs have bolts or fixed pitons but pay attention to the their security when found, especially in the poor Chugach rock. When encountering webbing left by previous climbers, please be courteous, and remove and replace it. It's strange how climbers will trust their lives to old weather beaten webbing instead of investing $2.00 of new webbing into their safety. Replacing or beefing up old pitons is another courteous act of safety. As with all mountain sports, avalanche awareness is paramount. Southcentral Alaska is prime for frequent and large avalanches; heavy early season snowfall, clear skis with arctic cold and dry powder snow of deep winter, raging Chinook winds, heavy late winter snowfall and bright warm sunny days of spring all contribute to an unstable snow pack. Add in the mountainous terrain of Southcentral Alaska and it's no wonder that Alaska leads the nation in avalanche deaths. The state of Alaska has no avalanche forecasting center since the government rappelled funding in 1986. But the Chugach Mountains now have an avalanche forecast. As with all areas, seek out past weather patterns before heading into the backcountry and take notice of local warning signs while in the backcountry. Some climbs and areas are more of a threat to slide than others but every area is subject to a slide, either the climb itself or the approach. And not all slides consist of snow. Many areas are raked by mud and rock slides, and all climbs are subject to rock fall, especially in direct sunlight and during warm spells. Even though the deep dark canyons have little sunlight, the slopes and walls high above the climbs and out of sight can receive direct sunlight, weakening the snow pack and rock.